Yes, the picture says it all. Instead of Happy Birthday, there should be a warning stamped on the top of this cake: Hazard to One’s Health. Standard symptoms: lightheaded, dizzy, blurred vision (and not from the wine). 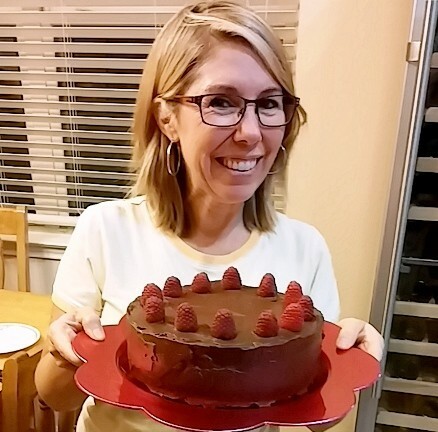 I started out this month working diligently on genoise and other cakes with the specific goal of creating a chocolate cake for my daughter’s birthday, and this is where it brought me. In fact, I was not going to even blog about it, because I would not recommend making this cake; it is too deadly. But at my daughter’s urging, I am giving it a mention. “Irresistible, mercilessly entertaining, menacing…” certainly apply here. In fact, these descriptive were picked from the cover of a book that my daughter just loaned me: Gone Girl by Gillian Flynn, a popular head-spinning thriller. I didn’t mean to scare everyone at my daughter’s dinner, but this cake really did the trick. So Happy Birthday, ChyAnn, your mother really does love you. The recipe follows with the best directions I can give. Standard warnings prevail. Inspired by America’s Test Kitchen. Line 2 – 9” or 2 to 3 – 8” cake pans with parchment (see below). Preheat oven to 325 degrees. Melt the chocolate and butter in large heat proof bowl over simmer water, stir until smooth. Allow to cool for 30 minutes and stir in vanilla and almond extracts and espresso powder. Process almond meal until fine in food processor; add flour and salt and pulse to combine. Transfer to medium bowl. In bowl of mixer, beat the eggs to combine then add the sugar and beat until thick and light, about 3 minutes. Gently fold the eggs into chocolate mixture until nearly blended; sprinkle in the almond-flour mixture and gently combine. Divide the batter into pans and smooth with spatula. Bake until center is firm when pressed and toothpick inserted comes out with a few moist crumbs, 14 to 16 minutes. Transfer to wire rack and cool in pan about 30 minutes. 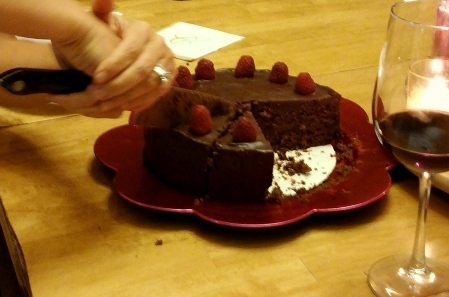 Run sharp knife around edge to loosen cake and turn out on to cake boards, right side up. Note: prepare the raspberry syrup and the ganache. The filling will be whipped, the glaze is the same recipe, but will be poured over the cake and sides to finish. The ratio of chocolate and cream is 1:1. It can be made in one large batch if making the same day. Combine raspberries, smash with a fork or potato masher in small pan, and bring to a boil. Simmer until soft and juicy, 3 to 4 minutes. Strain through a fine sieve. Rinse out the pan; measure the raspberry liquid and return it to the pan with an equal amount of sugar. Simmer until slight thickened, 1 to 2 minutes. Add 1/3 cup Chambord, rum, or brandy and simmer briefly. Strain mixture again, removing any foam as well. Pour into a clean container to cool and set aside. Chop the chocolate and place in a bowl. Heat the cream to a simmer; do not boil. (In microwave, about 40 seconds to 1 minute. ) Pour the cream over the chocolate and let is set briefly, for a minute or two. Gently stir with a fork to melt the chocolate and it is silky smooth. Let stand to cool, about 30 minutes. To lighten the filling, beat with a hand mixer for 1 to 3 minutes, depending on the volume desired. Pour the cream over the chocolate and let is set briefly, for a minute or two. Gently stir with a fork to melt the chocolate and it is silky smooth. If cutting one of the layers in half, use a long serrated knife to slice into 2 equal layers. Have an 8`springform pan ready as a mold to hold the torte in place. Brush the cut surface of one of the layers evenly with a light coating of syrup. Spread it evenly with about ½ of the whipped ganache filling, then place it in the springform pan, filling side up. Repeat with second layer, using cut side to coat with syrup and then with chocolate filling and place it in mold. Brush the third layer keeping the bottom of the layer to the top of the cake and coat the cut side with syrup. Place it in the springform with the bottom side up. Cover the cake and chill well; up to 24 hours. To finish to the torte. Unmold the cake and brush any loose crumbs off the exterior of the cake. Coat the cake lightly with ganache using an offset spatula or knife to seal both top and sides. Chill to set, about 5 minutes. Place cake on wire rack and crumb coat the cake by spreading top and sides with a thin layer of the ganache glaze to cover. Let set in fridge 15 minutes. Meanwhile, keep the ganache over warm water, stirring occasionally to keep it from thickening too much. For final glaze, pour some of the ganache into center of the cake, using offset spatula, spread with broad strokes so that residue will to run down the sides; spread to evenly coat any uneven spots. 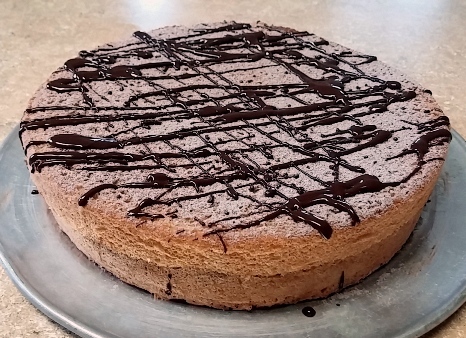 Back in July I mentioned that I was working on mastering the French genoise. I am still at it and am more impressed than ever with the amount of technique and skill required to pull this off. When you consider it is just a basic recipe of eggs, a little sugar, a bit of flour and a smidgen of butter, you wonder how anything so simple could be so complicated. Well, this could easily stand as a metaphor for any one of life’s lessons that come our way regularly. In this case it is all about knowing when to follow the rules: to recognize that tricks in fine baking have been passed down because they work. For example, bakers weigh their ingredients because proportions and formulas are the backbone of their craft. In the case of the genoise, nothing could more essential to its success than the eggs. It is recommended that eggs and sugar be beaten over simmering water: the gentle heat further binds the eggs and sugar and creates the massive volume. Of course, I resisted this process until attempt number three, and it worked beautifully. Then you have to maintain its structure since there is no other leavener. To deal with egg deflation, the other vital trick I learned was how to fold. I had to practice the process of correctly lowering a wide spatula into the batter, bringing it up, dragging it gently over the top, turning the spatula in a gentle folding motion down into the batter, and back up again. This slow folding is used to incorporate the flour and even more crucial, the butter—which lends richness and texture to a fairly dry cake. With a description like that, why bother with such a dreary cake? Because it is lean and incredibly versatile. 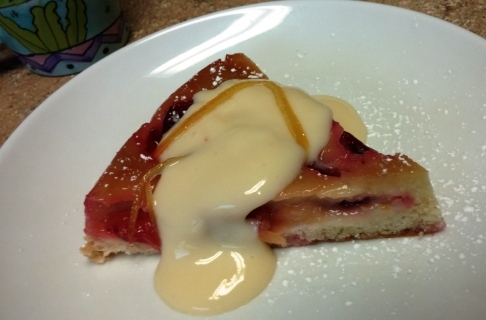 The genoise is regarded as the foundation in a world of sweet fantasies. So well structured, it can be torted, or cut into multiple layers. 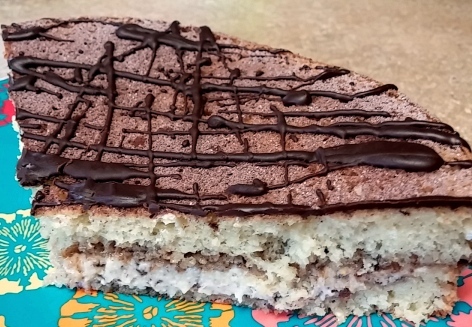 These layers can be brushed with a wild variety of syrups which soak into the cake, tailoring both flavor and moisture. The sky is the limit when it comes to accessorized fillings: curds, creams, chocolate fillings, you name it. Finally, I actually achieved a cake tall enough to safely cut in half (so very proud). I brushed the layers with hibiscus syrup (made from hibiscus jelly) and heaped on an Italian style ricotta filling laced with almond and chocolate. Since I had extra chocolate on hand, the rest was drizzled across the top. It is the thing that dreams are made of. Preheat oven to 350 degrees. Butter and flour 8” or spray 8” cake pan, line it with parchment or wax paper. Melt the butter and set aside in a 2 cup bowl to melt further and re-thicken. Whisk the eggs and sugar in a mixing bowl over simmering heat, until the mixture feels lukewarm. In bowl of standing mixer using wire whisk attachment, whisk the eggs until they have tripled in volume, 5 to 10 minutes. They should be thick, creamy and fall from the whisk resting in ribbons onto the batter surface. Whip in the vanilla or other flavoring. Sift the flour while the eggs are beating. Re-measure to ¾ level cup and sift again with salt. Fold in the flour: for ease, pour the egg mixture into a wider bowl. Using a wide spatula carefully sift flour onto surface in 3 portions, To fold in the flour, carefully cut down and fold up and over, stretching the batter to lighten and incorporate the flour in about 10 turns each time – scrape the sides and bottom, too. Add butter to batter: re-combine the melted butter; it should be slightly warm and creamy. 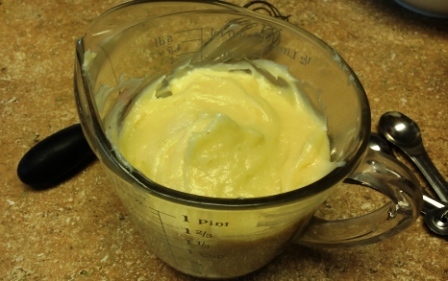 Gently spoon out about 1 cup of batter and fold into the butter until thoroughly mixed and light. Gently pour this onto the side of the batter and fold another 10 times to incorporate. The batter is at its weakest point: it may not be completely smooth, still have streaks, and begin to deflate. Fold cautiously. Pour batter into pan, gently smoothing surface from middle out. Tap the pan on counter a few times to remove lingering air bubbles. Bake at 350 degrees in center of oven 25 to 30 minutes, until the edges begin to come away from pan and the center springs back when touched and is golden brown. Let cake rest briefly, run a sharp knife around the edge of pan and cool 5 to 10 minutes on rack. Unmold the cake, remove paper from bottom and cool right side up. If not using same day, it can be held at room temperature overnight, well wrapped. Can be stored well wrapped – up to 3 days in refrigerator or in freezer for up to 2 months. If frozen, defrost wrapped cake at room temperature. It is ready to be sliced horizontally into 2 or 3 layers, filled and decorated. Note: Above, you’ll note I am still resisting the weighing of ingredients. So far, I have good luck with careful measuring (I measure the flour twice). It seems to work deliciously! Lately I have been preoccupied with conquering the génoise and some of its many accoutrements. 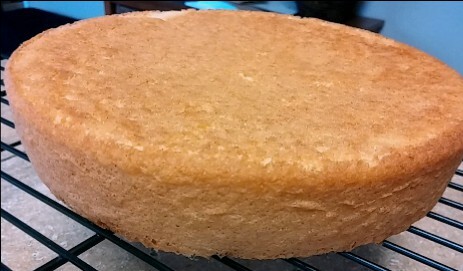 Similar to our sponge cake, génoise is considered the go-to all purpose cake in France. I am very excited about adding a well-structured basic cake to my baking repertoire and the génoise is one of the legendary building blocks in French patisserie work. Beginning with the “simple” génoise formula, endless sweet options are attainable: individual cakes and glazed petit fours, molded madeleines and free-formed lady fingers; novelty filled rolls and stylish holiday logs; and of course stunning cakes for every occasion. There are a few hurdles. The cake’s tight structure comes from a lengthy beating of eggs and sugar until it is triple in volume. A bit of flour is folded in and then a little melted butter is added on the finish. How hard can that be? I’m learning a fair amount of precision, gentle handling, and adept folding are required to successfully pull this off, as the fragile eggs tend to deflate into a bewildering puddle. But, my goal is to create the perfect chocolate génoise for my daughter’s birthday in August. I have time to tinker. With that I mind, I continue to crank out my own génoise creations. For the 4th of July, it was a strawberry cake soaked with orange syrup, slathered in whipped cream. A tad dense, but with all those goodies, no one complained. Today I achieved another moderate success: an upside-down Pho-flavored plum cake accompanied by a head turning ginger-lemon pastry cream. I’m not sure the cake would receive high marks in any French bakery, but the more I eat, the more I like it…especially the pastry cream; but for now I will not bore you with further cake details. You will be hearing more about the “génoise project”, as we lead up to the main event in August. Today’s focus was all about running the pastry cream through its paces and testing a companion syrup for the cake. Pastry cream, or creme patisserie is a basic cream filling with endless potential. It is used to fill a variety of cakes, tarts, cream puffs and other pastries. Similar to a custard, eggs and milk are simmered to thicken, but now flour and cornstarch are added not only to thicken but to also strengthen and stabilize the custard for greater durability. Almost any flavoring or liqueur can be added to the cream to suit the desired effect and composition: vanilla, almond, chocolate, etc. Since génoise can be slightly dry, complementary syrup is often brushed on the cut layers to moisten and provide additional flavor. However, my upside down cake was tricky enough with caramel glazed plums; I opted to pass on further slicing and filling. 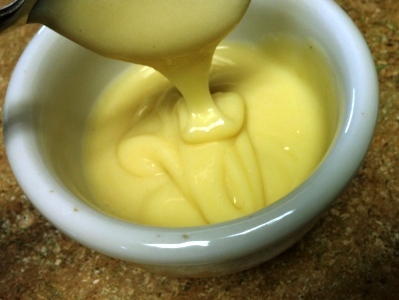 Here, I thinned the pastry cream with additional ginger-lemon syrup to make it thinner and more pourable – a return to the custard sauce state. You will note how well it continues to hold its shape in the photo provided. Following are basic recipes and ideas for flavored syrup and pastry cream. In small pan dissolve sugar in water. Add syrup and bring to a boil. Simmer 2 – 3 minutes. Add flavoring and cool. Orange: substitute orange juice for water. Add peel of ¼ orange to pan. Ginger-Lemon Syrup: steep 1 ginger-lemon tea bag in 1 cup boiling water for 5-10 minutes. Use this infusion for the syrup water along with peel from ½ lemon and ½” slice fresh ginger, peeled. Proceed and simmer for 2 to 3 minutes. Let cool and remove ginger and peel. The lemon strips can be used to decorate the cake, if desired. Heat milk to near boiling, with the milk steaming hot. In small saucepan mix the egg yolks and sugar to combine. 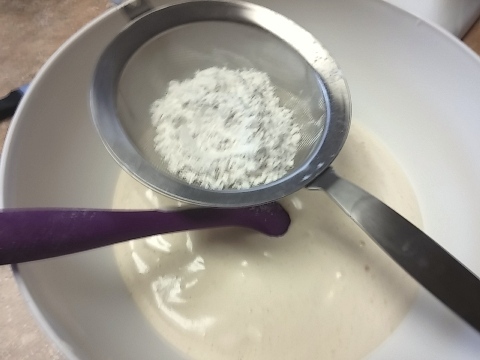 Sift the flour and cornstarch together and slowly add to the egg mixture, stirring to incorporate before adding more until a thick mass forms. Slowly add the hot milk to the egg mixture until it is combined and there are no lumps. Place pan over medium heat; while whisking bring mixture to a boil and cook briefly until it is thick. Remove from heat and add vanilla or other flavoring. Let cool 4-5 minutes and whisk in bits of butter until smooth. Ginger-Lemon Sauce, thin the pastry cream with ginger-lemon syrup to desired consistency.